Hawick councillors say the only way is up at the town’s high school after police were drafted into restore order in classrooms there. The unusual move was taken to support staff after a rise in anti-social behaviour at the Buccleuch Road school. At a meeting of Scottish Borders Council’s Teviot and Liddesdale area locality committee this week, Hawick police inspector Carol Wood provided an update on the problems, saying a “minority of pupils were causing problems for the majority”. Ward members said the action taken to date had proved successful and they are confident that the issue can now be resolved. Hawick and Denholm councillor Stuart Marshall said: “From what we are all hearing now, the matter has just about run its course. 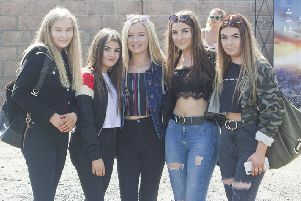 “It has been sad that the town has been highlighted for the wrong reasons with regard to Hawick High School, but there is a lot of good work going on in the background, and I pay tribute to the education department, the police and the teachers and staff and the pupils who have all worked closely together to resolve the issues. Hawick and Hermitage councillor Davie Paterson said: “They have all contributed towards turning this situation around. Hawick and Denholm councillor Clair Ramage used to teach at the school and one of the reasons she left was a rise in anti-social behaviour there. She said: “I must say that, as a former teacher, this has been a long time coming. “I am just glad that we have now probably reached the bottom, and the only way is up. “The vast majority of pupils in that school are well behaved. “It’s sad that it came to this, but it was coming.